Charlie Powerscourt returns! Senior at an English boarding school, of voracious sexual appetite and loose of morals, he loves nothing more than a fine fumble with his fellow boarders. In a variety of combinations and permutations he and his accomplished and affluent peers will enjoy many a night in the wildest of abandons. But not before Gaston, the group's, foreign addition and knowledgeable in all libidinous things Parisian regales them in a tale or two to whip them up into a veritable frenzy; tales of group-menages, soixante-neufs, and Lesbian tribades. And how will he spend his vacation, between the naughty maids of his household? Or at Gaston's estate in France? or both? Charlie will finally have an opportunity to worship at the alter of Venus and join his good friend in the company of those whose wanton proclivities stretch to both female as well as male. This rare work of bisexual erotica brims with the youthful vigour exhibited by its scandalous protagonists, where no experience is beyond their contemplation, no peak of ecstasy beyond their graspings. 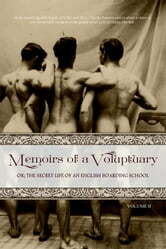 Including a subtle lashing of birch discipline and submission for good measure, Volume II of Memoirs of a Voluptuary will be sure to pique the interests of those a fan of once-suppressed Victorian literature.